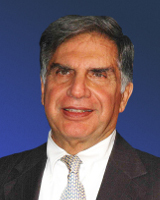 Ratan Tata 28 December 1937 Naval Tata Sooni Tata Entrepreneur, Businessman The Chairman of Tata Group for almost two decades. He is a true example of a distinguished entrepreneur. A quiet personality and his low profile style is what make him the leader that he is. His silent determination has made the company a global name. A list of popular ratan tata quotes are given below.